The Levush (1 and 559:1) was of the opinion that the haftarah must be read from a klaf observing the same rules as the sefer Torah since kriat ha'haftarah is only b'tzibbur. Other authorities disagree and say that one can also read from a printed text. 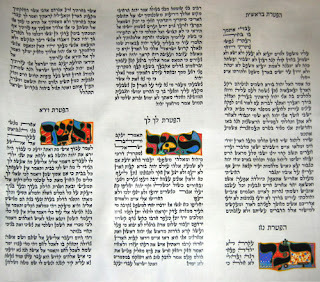 The Magen Avraham, for example, states that it is preferable to read from a Tanakh containing a complete Navi than to read from a Chumash that contains only the specified portions. However, the Magen Avraham, the Taz and the Mishnah Berurah all state that one fulfills his obligation by using even a Chumash, or Haftarah book. 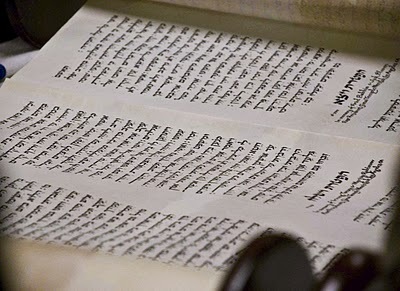 Historically, there has perhaps always been this question of the validity of taking the various portions of the Nevi'im and writing them together into a sefer. In Gittin 60, Rabah and Rav Yosef hold that it is usser to write anything but complete sefarim of Tanakh. Mar bar Rav Ashi even holds that such a sefer is muktzeh because one is forbidden to read from it. The halakha, however, appears not to be according to these positions on the grounds of eit laasot laShem, because the purchase of a complete set of navi on klaf would be beyond the financial means of a tzibbur. 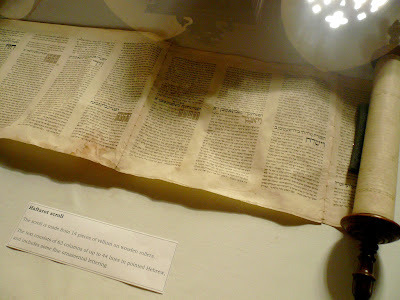 Taz and Magen Avraham hold that in our days since printed Nevi'im are inexpensive eit laasot laShem no longer applies. Despite this, there appears to be in recent years a growing trend to write sifrei haftarot on klaf. I became aware of one commissioned by the FJMC (Federation of Jewish Men's Clubs) in 2003, which travels on a weekly basis from synagogue to synagogue across the US. Each of the Haftarot portions appear in order with the title, trope marks and nekudot written in by the sofer. In this particular sefer haftarot under the title of each portion is inscribed the name of the group which sponsored the writing. Note also the taggim are omitted presumably to allow for the insertion of the trope marks. There are even "sofrim" who offer illuminated haftarah scrolls as the one seen above which enlarges and illustrates the first word of each haftarah. 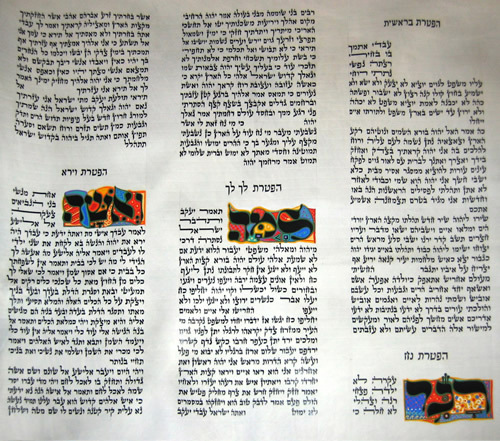 As a variety of sifrei haftarot handwritten on klaf are becoming more and more common not only in reform and conservative temples, but even in a number of Orthodox synagogues both in the US and Israel, it occurs to me to ask what is the halakhic status of such sifrei haftarot? Thanks for this blog. According to what I see the haftorot are not genuine csav ashuris, they are with nekudos taamim etc. 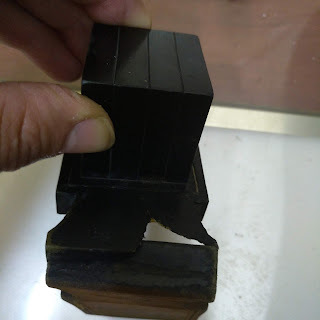 Therefore they have only the kedusha of chumashim - sacred books, just like printed books, they don't have the kedusha of nevi'im, so it is recommended not to mekadesh the shemot when writing these haftora books. What would be the situation if they were written without te-amim or nekudot. Would you then have to mekadesh the shemot? this should not be done since one is not permitted to write a part of a navi, only the complete book [of the navi]. 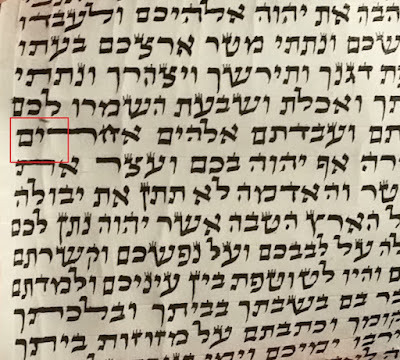 Obviosly he should not mekadesh the shemot that are written באיסור in this scroll. Thanks R' Moshe. It seems strange to me to go through the enormous effort of handwriting such a sefer, then adding all the nekudot and taamim by hand only to end up with a really expensive chumash. I did a little research, these sifrei haftorot are not cheap, one sofer sells them for $30,000 each. 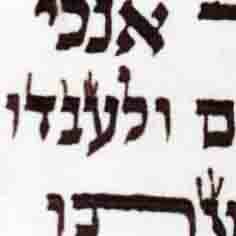 Do sofrim Mekadesh Shem Hashem when writing Ketoros?